Australian owned defence and space company Electro Optic Systems (EOS) has been selected to supply remote weapon stations (RWS) for the Army’s new Boxer Combat Reconnaissance Vehicles (CRV). These remotely operated weaponised systems enable soldiers to fire a range of weapons, while crucially still remaining safe inside their armoured vehicles. 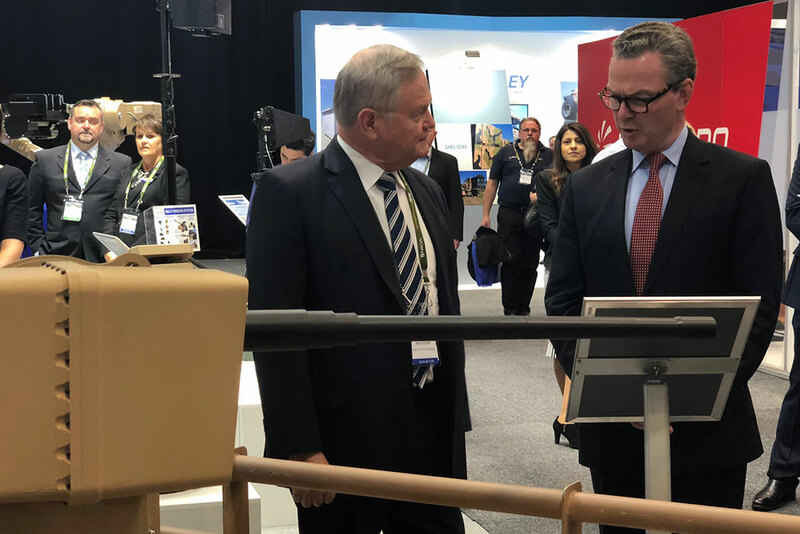 In making the announcement at the EOS stand at LAND FORCES 2018 Exhibition in Adelaide, Defence Industry Minister Christopher Pyne said the move would increase Australian industry involvement in the project. The Minister also announced EOS’ newest RWS, the R150, which was developed with a $3.4 million funding assistance from the Commonwealth. “This is a pivotal example of how Commonwealth investment in innovative proposals can develop future Defence capability, create jobs and boost our defence industry in Australia,” Mr Pyne remarked. EOS, which was established in 1983, operates in the aerospace and defence markets, incorporating advanced electro optic applications based on its core technologies in software, lasers, electronics, gimbals, telescopes and beam directors, and precision mechanisms. The company has also supplied remote weapon stations for Army’s in-service Bushmaster vehicles.